The Eurozone faces zero inflation paired with low economic growth. With monetary policy hobbled by the zero lower bound, it is time to think more broadly. This column discusses the theoretical and empirical evidence on ‘unconventional fiscal policy’. Such policies aim to increase growth and inflation in a budget-neutral fashion, while keeping the tax burden on households constant. The conundrum the Eurozone faces is finding a recipe to support inflation and ultimately consumption and economic growth in a setting in which traditional monetary policy measures are not viable, and governments cannot support growth with fiscal spending because of their large debt-to-GDP ratios. In this column, we discuss an alternative to monetary interventions, which we call unconventional fiscal policy. Unconventional fiscal policy aims to increase growth and inflation in a budget neutral fashion, while keeping constant the tax burden on households. A series of pre-announced increases in the value-added tax (VAT) to generate consumer price inflation, and hence increase private spending via intertemporal substitution. The intuition for this proposal is based on a simple logic: announcing higher prices in the future will increase current inflation expectations. Higher inflation expectations at times of fixed nominal interest rates should reduce real interest rates (Fisher equation), and lower real interest rates should increase households’ incentives to consume rather than save (Euler equation). Because imposing higher VAT reduces households’ wealth – especially poorer households’ wealth – and might affect households’ labour supply, lower income taxes (or transfers for those households that do not pay any income tax) should accompany the increase in VAT. Designed this way, the policy measure would be budget-neutral for the government, as well as for households. It would incentivise households to consume immediately, jump-start the economy, and hence help the economy exit the slump. In his presidential address to the 2011 American Economic Association Annual Meeting, Bob Hall (2011) reiterated Feldstein’s ideas, and encouraged further research to understand the viability and effects of unconventional fiscal policy, both theoretically and empirically. In the US, the proposal of announcing a national sales tax to take effect on a specified date in the future to quicken up the recovery at times of economic downturns was advanced at least since 1991, in an op-ed for the New York Times by Matthew Shapiro (Shapiro 1991). In Shapiro’s words, “How would such a proposal work? […] Consumers, anticipating the tax increase, would accelerate their purchases, particularly of durable goods. This would stimulate the economy immediately, though there would be no immediate direct impact on the deficit." Discretionary fiscal policy is often rejected as a tool for business cycle stabilisation. It is less desirable than conventional monetary policy because of implementation lags, larger permanent deficits resulting in higher long-term interest rates and distortionary future taxes, and higher marginal propensities to save out of a temporary tax cut (i.e. lower (old) Keynesian multipliers). At the same time, fiscal policy might stimulate demand at times when conventional monetary policy is not viable. Feldstein (2003) stresses that discretionary fiscal policy does not need to rely on questionable income effects, but could fully operate through an inter-temporal substitution channel by increasing private incentives to spend. Higher inflation expectations lead to higher consumer spending today. Unconventional fiscal policy can be expansionary and, at the same time, avoid budget deficits. The first theoretical formalisation of Feldstein’s proposal was in Farhi et al. (2013). The authors show unconventional fiscal policies, including higher future consumption taxes, can completely offset the zero-lower-bound constraint on nominal interest rates by generating consumer price inflation without distorting production decisions. When higher future consumption taxes meet cuts to income taxes, the economy can reach a first best outcome, despite the distortionary nature of income taxes. Overall, unconventional fiscal policies counteract deflation and spur economic growth at times of low output gaps. Crucially, they do not worsen the governmental budget, and they keep constant the tax burden on households. The only mechanism at play is the inter-temporal substitution of consumption. These measures should be more relevant for durable and storable goods, which represent a large share of households’ consumption bundle. In a recent paper (D’Acunto et al. 2016), we test empirically for the effect of unconventional fiscal policy on households’ willingness to purchase goods through the inflation expectations channel. To construct a viable counterfactual to German households’ behaviour after the shock, we look at households in other EU countries for which we obtained micro data (France, Sweden, and the UK). A concern is these households might not behave similarly to German households. Figure 1 provides evidence that foreign households did in face behave similarly to German households before the shock, in November 2005. We construct a difference-in-difference identification strategy. We compare the willingness to purchase of German households with that of foreign households, both before and after the VAT tax increase shock. To run the analysis at the household level, we match German households with similar foreign households before the announcement of the VAT increase in November 2005. The matching is based on the propensity score, estimated with observables that are homogenously elicited across countries through the harmonised questionnaire of the EU Directorate General for Economic and Financial Affairs. We test formally that German and foreign households are indistinguishable across the matched observables after the matching. In January 2006, German households were 3.8 percentage points (s.e. 1.5 percentage points) more likely to be willing to purchase durable goods compared to before the shock, and compared to the matched foreign households. The effect built up in 2006. Figure 2 reports the size of the monthly estimated effect over time. The effect peaked at 34 percentage points in November 2006. 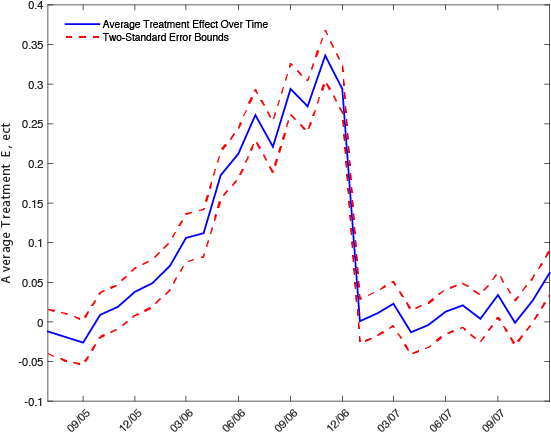 The average treatment effect dropped to zero in January 2007 once VAT actually increased and higher inflation materialised. Importantly, we do not detect any reversal of the positive effect of the VAT shock on the willingness to purchase durable goods after January 2007. German households behaved similarly to matched foreign households not exposed to the shock before the announcement of the VAT increase and also after the actual increase. Different to measures like fiscal stimulus which aim to spur purchases of durable goods worsening the government budget (e.g. Mian and Sufi 2012), we find an income effect cannot explain these results. What should the ECB and European governments do? The theoretical and empirical research discussed above has clear-cut implications for policymakers. These implications are especially relevant at times of low inflation and low growth, paired with the non-viability of conventional measures of monetary and fiscal policy, as is currently the case in the Eurozone. A series of pre-announced VAT increases and a simultaneous reduction in income taxes – or direct transfers for those households that do not pay income taxes – would result in a predictable increase in inflation without inducing additional uncertainty.2 They would increase consumer spending hence growth today, and would not lead to higher budget deficits, all while keeping the total tax burden of households unaffected. Ideally, the last of the series of increases in VAT becomes effective after the end of the liquidity trap when conventional monetary policy has regained power. The governments should reverse the tax changes during normal economic times to keep the gunpowder try for the next economic slump. These measures should be easier to implement in a consensus-based institutional setup like the current European Council compared to other fiscal and monetary proposals. They could satisfy both the instances of central and northern European countries, which do not want to allow for higher budget deficits in the Eurozone, as well as the instances of southern countries, which want to exploit fiscal policy to spur growth without further increasing the high tax burden on households. Because these measures do not involve monetary easing and open a path to future interest rate increase, they would not be opposed by the banking, corporate, and household sectors of central European countries. If Mr. Draghi wants to counteract the “forces that are conspiring to hold inflation down,” Eurozone governments and the European Council might be his best allies after all. Bernanke, B (2010), “Monetary Policy Objectives and Tools in a Low-inflation Environment”, In speech at a conference on Revisiting Monetary Policy in a Low-Inflation Environment, Federal Reserve Bank of Boston, October, Volume 15. Blanchard, O, G Dell'Ariccia, and P Mauro (2010), “Rethinking Macroeconomic Policy”, Journal of Money, Credit and Banking 42 (6), 199-215. Draghi, M (2016), “How Central Banks Meet the Challenge of Low Inflation”, Marjolin Lecture. Eurostat (2016), “Annual Inflation down to -0.2% in the Eurozone”, Press Release Euro Indicators. Farhi, E, I Correira, J P Nicolini, and P Teles (2013), “Unconventional Fiscal Policy at the Zero Bound”, American Economic Review 103(4), 1172-1211. Feldstein, M (2003), “A Role for Discretionary Fiscal Policy in a Low Interest Rate Environment”, In: 2002 Federal Reserve Bank of Kansas City Annual Conference volume, Rethinking Stabilisation Policy. Hall, R (2011), “The long slump”, American Economic Review 101(2), 431-469. Mian, A and A Sufi (2012), “The Effects of Fiscal Stimulus: Evidence from the 2009 ‘Cash for Clunkers’ Program”, Quarterly Journal of Economics. Shapiro, M (1991), “Economic Stimulant: Sales Tax”, New York Times, OP-ED, 16 December. effects of the VAT increase are; as is the case for oil prices, we do not consider one-off effects." European governments have implemented direct transfers to selected groups of taxpayers and non-taxpayers in the last two years, which were not counteracted by higher VAT taxes to neuter their effect on the government budget (e.g., see the “Renzi bonus” in Italy).